Ray Tracing technology, popularized in NVIDIA’s latest round of Turing ‘RTX’ graphics cards, now falls under an extension to DirectX 12, called DXR, or DirectX Raytracing. DXR builds upon the DX12 API by enabling new commands to facilitate ray tracing implementations with acceleration structures to help ray tracing and shader tables to define relationships between shaders and resources. Ray tracing can be implemented in several ways: calculations done in FP32 mode (slow), calculations done in FP32 and INT32 modes (a bit faster), or use specialised hardware such as RT cores (fast). For all the titles that currently have had ‘ray tracing’ enabled, having RT cores has been a fundamental requirement. For the April Driver from NVIDIA however, Ray Tracing (through DXR) is being enabled for the newest NVIDIA cards that do not have RT cores (Turing GTX, GTX 1660 and GTX 1660 Ti), and Pascal (GTX 1080 Ti to GTX 1060). So looks like DXR is coming for Pascal and new GTX 1660/Ti! Who wan't to guess what AMD is planing with their Compute power on Polaris and Vega 56/64/VII? It seems they're drawing the line between DXR and RTX, for obvious reasons. Hopefully AMD gets DXR enabled soon too. Last edited by Gunderman456; 03-18-2019 at 04:25 PM. I think many Dev's show them what they think about RTX vs DXR and NV had to come down from the tree. RTX cards are irrelevant in market share so it's so stupid for Dev's to support RTX while DXR is the future(consoles). Now that the gig is up thanks to Crytek's demo and I'm guessing that Navi was going to release with DXR capabilities and also be backward compatible, Nvidia got a whiff and is now all of a sudden supporting ray tracing across the board (6 months after the RTX release of course) so they can look like the good guys. For those with eyes to see, sniff, sniff, Nvidia still comes out smelling like a green turd. What? It's likely nvidia was the one who came up with DXR, MS typically doesn't just make hardware addressing APIs without cooperations from hardware OEMs. Nvidia was the Microsoft hardware partner that created the demo for the DXR reveal. https://devblogs.microsoft.com/direc...tx-raytracing/ And in the first place RTX is a hardware extension that's accessed through the graphics APIs, including DXR. It's no different than the original Trueaudio, Polaris's geometry culling block, or arguably even the geometry/tessellation shaders. Also, it's likely Nvidia had this planned from the start, not sure how you can pull a fast one on a company who hasn't even seriously committed to DXR yet. AMD has been relatively quiet while Nvidia's been peddling this thing everywhere, even calling RTX features as DXR in statements to the press. 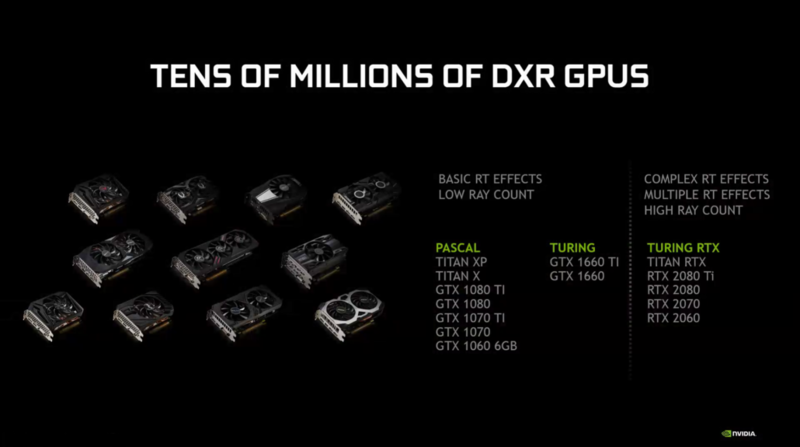 DXR is an nvidia baby. So the entire marketing about needing rt/sensor cores was baloney? Nvidia just got caught with their pants down. I would be pissed if i bought an RTX card, but from what i hear isnt many. Last edited by m4fox90; 03-18-2019 at 04:36 PM. Given how Nvidia was heavily involved in developing DXR api and also Vulkan ray tracing, sooner it becomes widespread, it is exactly what Nvidia wants it to happen. shady coincidence indeed. kinda figured this was coming anyways after Titan V was able to run RT and then the cryengine demo came out(hoping more developers jump on the engine, either way crysis 4 with RT high will melt PCs until year 2250). Definitely makes me glad I picked up a cheap used 1080Ti instead of going for the 2080!